The Avengers: Age of Ultron trailer has been out for nearly two months, and there’s still plenty to digest from those two minutes of action. One of the preview’s main mysteries is the battle between Hulk and Tony Stark’s Hulkbuster armor. What could possibly lead to these two throwing down in fisticuffs? Naturally Hulk is the first one to blame because of his anger issues. After all, he has a habit of going wild in the comics. However, now we may have another answer for how this conflict comes about, and it comes from a box of toy bricks. 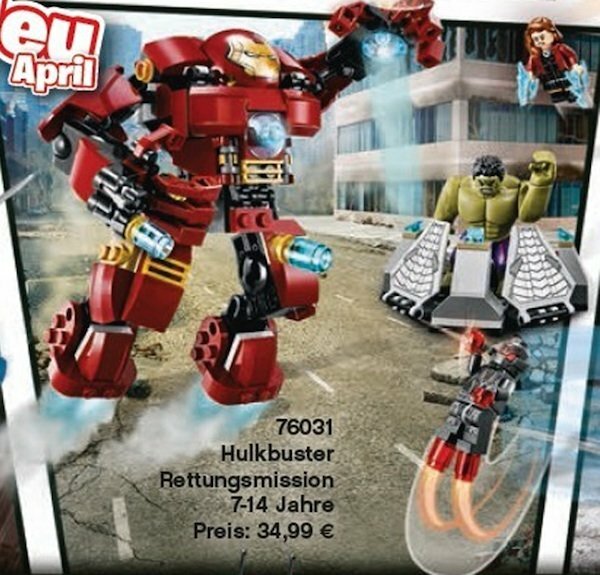 The German version of the online LEGO catalogue (via io9) has released first looks at six of the Avengers: Age of Ultron sets coming out next, including one called "Hulkbuster Rescue Mission." The set features Hulk trapped in a strange device with the Hulkbuster suit standing nearby. Scarlet Witch looks like she’s on her way to save the green giant, but Ultron in the corner will have something to say about that. Obviously these sets might not be direct adaptations of scenes from the movie, but they do point us in the direction of how things might go down. In this case, Tony Stark might not even be in the Hulkbuster armor during this scene. It could be that the armor is being controlled by Ultron, and Hulk is just practicing self-defense. Although Bruce Banner seemed like he had a good handle on his Hulk abilities at the end of The Avengers, the biggest risk The Hulk poses is his unpredictability. One minute he might be cool with teaming up with the other Marvel heroes, the next he’s throwing a tantrum because someone made him angry…and you won’t like him when he’s angry. So naturally Tony would develop the Hulkbuster armor as a contingency in case the Hulk ever went rogue, just like he did in the comics. However, Ultron’s abilities include being able to control machines, and as we saw in the trailer, he has plenty of robot minions at his command, It’s possible that the megalomaniacal artificial intelligence corrupted the Hulkbuster and sicced it on the Green Goliath. Perhaps Tony is stuck in the armor and can’t control its actions, similar to what happened to War Machine in Iron Man 2. Obviously there’s still the possibility that Ultron somehow sets Hulk off on a rampage, but given that Ultron’s endgame is to wipe out humanity, having an artificial creation destroy an organic being seems more poetic than just mind-controlling the gamma-powered scientist who belongs in a Rageaholics meeting. Another thing to note about this LEGO set is Ultron’s appearance. In the trailer, we saw two of Ultron’s forms: the robotic look at Avengers Tower and his more human-looking appearance at the end of the preview. The LEGO Ultron, which is labelled "Ultron Prime" looks more like our first look at the character from that Entertainment Weekly, which is visually closer to how he appears in the comics. If I had to guess, I’d say this "prime" form is his second stage of evolution that will occur about halfway through the movie, and during the climax he’ll reach his human-like form, freaky eyebrows and all. Avengers: Age of Ultron will hit theaters on May 1, 2015. In the meantime, give the first trailer another viewing to see if you can figure out why Hulk and the Hulkbuster armor are fighting.